Grab a handful of candy corn, this is a long (but super informative) update. BOOO! Many OHV Trails Close October 31. But others remain open. -- Check your MN DNR OHV Trail Atlas or the DNR web site for trail closing dates. Many State Trails close October 31, but others remain open to November 30, and some (including Spider Lake) are open year-round. Many Forest Roads in the Chippewa National Forest also remain open through November; check the MVUM for exact dates. Remember, State Forest Trails and Routes are closed to recreational riding during deer hunting season. Licensed deer hunters may use ATVs on these routes in conjunction with their hunting activity from 11 a.m. to 2 p.m. and after legal shooting hours. SCARY! Legislature/DNR To Change ATV Definition...Again! -- It used to be easy to know where to ride along public roads. Regular ATVs were in the ditch of county roads, side-by-sides were on the shoulder. But the DNR raised the dry weight of Class 1 ATVs to 1200 lbs., which created lots of confusion. At that definition, only full-size Side-by-Sides like the Ranger XP 900 and RZR 1000 would be allowed on the shoulder of county roads. Everything else has to go in the ditch. I visited with State Rep. Tom Hackbarth at the MNUSA Fall Workshop last weekend. He said there is a work group of people from the DNR, ATVAM and ATV manufacturers working on changing the ATV definition again. Stay tuned. We’ll see what the Legislature does in the next Session. Hopefully it’s not too scary! WOODTICKS INVADE CALIFORNIA! Members Bill and Lisa Garbe are riding this week in the Imperial Sand Dunes, better known as Glamis, in their 700 HP sand rail and sport ATVs. Maybe we should trailer out for a club ride next year. All those in favor, raise your helmets! MORE RIDES! We tried but failed to get more rides this year, as requested by our members. We’ll do better next year, planning on at least one club ride a month from May through October. If you have a favorite trail you’d like the club to go to, let us know! Club Ride / Poker Run & Highway Cleanup -- Thanks to the 13 members who came to the last club ride of the season on October 4th, enjoyed a ride under the fall colors, lunch at Huddle’s Resort, and helped clean our Adopt-A-Highway section at Whipholt. Sue Anderson won the poker run with a full house, winning her choice of $25 Gift Certificates we purchased from some of our Biz Members. We’ll be supporting all our Biz Members this way. 24 Kids Attend ATV Safety Class -- Thanks to 11 of our certified instructors, plus helpers and Cass Cty Deputies Landreville and Collette, for spending part of their Saturday on October 11th to hold our annual ATV Safety Class at the WACC. We used our club’s new projector to show a slide show to 24 kids and their parents, covering the class content, answering lots of questions and certifying all the youth riders. Kids without an ATV rode our club’s Polaris 90. One family liked our class so much they joined the club! Interested In Being An Instructor? -- There is a DNR ATV safety instructor class scheduled for December 8th in Grand Rapids. Get all the details at this link: https://mail.aol.com/38815-616/aol-6/en-us/Suite.aspx. Trail Ambassadors Volunteer 400 Hours -- Thanks to all our DNR-certified Trail Ambassadors, who spent many Saturdays monitoring the state ATV trails, helping keep them safe for the public. In addition to reimbursing our TAs for their expenses, the grant also allowed us to pay for another big shipment of ‘Adventure Trail’ coloring books and crayons to distribute in our area, and make a donation to the Coalition of Recreational Trail Users (a MN educational non-profit of OHV and snowmobile groups) to help create much-needed, rider-friendly OHV maps for the Chippewa and Superior National Forests. Our club is on the work group for that project. A big thank-you to John Dickerman for all his work this year as our TA Grant Manager! Whipholt Beach Road Still Open to ATVs -- Pine Lake Township closed the road from Whipholt to the beach to all motorized traffic. Local residents and businesses complained, and the “No Motorized Vehicles” sign was removed. You can still ride your ATVs down to the Whipholt Beach, with a nice sandy beach and fire grates for a family picnic! New Team’s Mission: “Open The Woodtick!” -- We need new ideas to get our message to the Forest Service and its new leadership. Interested in helping? Contact a board member. Especially need members who currently can’t access the Forest Roads on their ATVs from their homes or cabins on lakes north and south of the Woodtick, to hear your stories and ideas. Thanks To All Our Individual, Family and Business Members! -- We now have over 400 members. 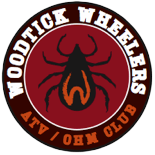 We have fun rides and events, continue to work hard to create a positive future for OHV riding in our area, build community support, and promote safe and responsible riding. Thanks for your support! Send us your comments and ideas for fun rides and events!